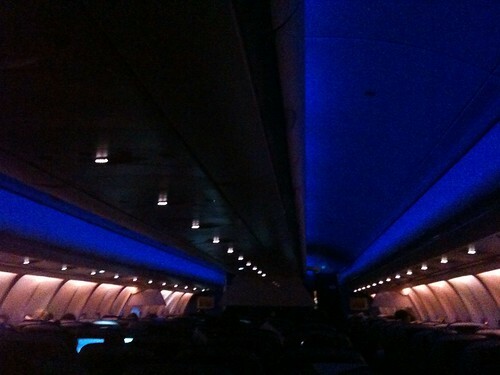 Flying from Dulles Airport, to Amsterdam Schiphol, typing as I go. This might be a bit of a whiny ramble. 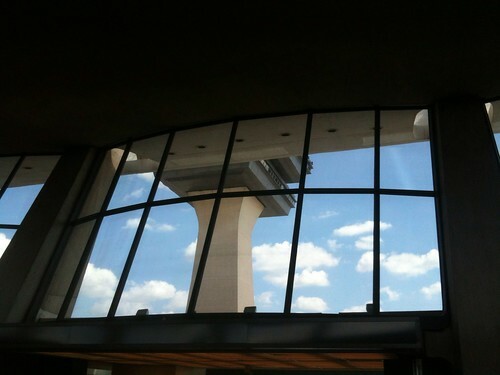 Dulles again, just over a week since we were here for Atlanta. Booked flight to Venice on Delta but it’s a codeshare with KLM so check-in is at the combined Air France/KLM counter. The check-in system has forgotten our seating assignments and reassigned us randomly for both flights, so I must re-select our seats at the kiosk. Printing time for boarding passes and trip summary stubs: forever. Waiting time in queue for bag drop-off: forever. Backscatter x-ray machines at security. I don’t know how much radiation I’m getting but it must be a lot less than the cumulative dose the TSA agent leaning on the machine beside me must be accumulating all day. The bag x-ray flags Amy’s backpack as requiring further screening, so she must unpack it in front of a TSA agent. They are unable to find the problem item and simply pass the backpack through the x-ray again before waving Amy through, so she can laboriously repack her stuff on the insufficient table space provided outside the TSA checkpoint. I wait for her on a creaky, forward-leaning bench with buttock-shaped indentations that seem designed to slide me onto the floor. With some time left before departure we have a late lunch of lo mein and orange chicken at City Wok in Terminal B. Probably the last “Chinese” food I’ll have for a couple of weeks. Boarding is slow and disorderly, just like the queue for check-in. 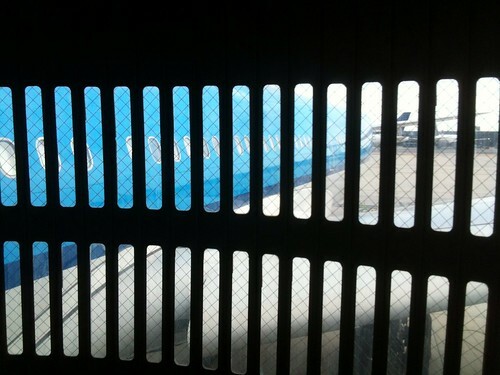 I start to think KLM may not be such a great airline. Our boarding passes get a red light and an angry beep at the gate scanner so we must stand aside while the ground crew enters our information manually. Possibly a Delta codeshare issue. 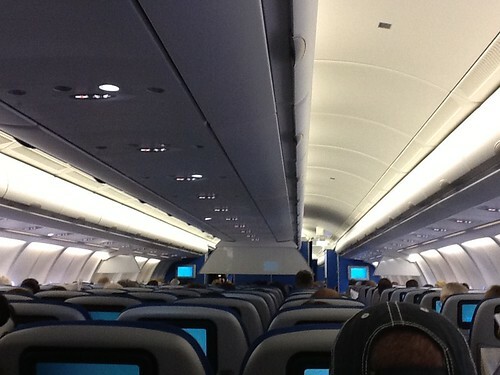 Plane is a KLM A330-300, which is a different plane from the reservation which says A330-200. I wonder if switching up to a higher-capacity plane is what triggered our seat reassignments. Seats 27E and F, coach, aisle, Amy graciously takes the middle seat. I will return the favor for her on the trip back. We are surrounded by crying babies, their screams drowning out the Dutch purser’s announcements. No delays, takeoff comes swiftly, and screens at every seat show exterior camera views for the benefit of those without windows. The baby-screams continue, almost coordinated such that one baby’s cry rises as another baby pauses for breath, and a constant wall of high-pitched screams pervades the entire environment of economy class, an infinite cacophony of piercing banshee wails without limit or end. The noise dies down somewhat as parents discover the children’s inflight entertainment channel but every announcement from the purser — drinks, mealtime, turbulence, duty-free shopping — blanks the screens momentarily, and children without any sense of object permanence think their Baby Einstein and Sesame Street videos have ended, and a new sonic wave of cries and screams sweeps anew through the cabin. Noise-isolating earbuds help immensely. Beside the screen there is also a USB plug, which keeps my phone charged through the flight. Not enough output voltage to charge the iPad, however. Unfortunately I am sitting in front of what I have categorized a “Puller,” one who, when standing, grasps the corners of the backrest in front of him — mine — and uses it to pull his considerable weight upwards, straining the seat and rocking me back and forth. He is a frequent Puller, and I note that as he traverses the aisle he walks as much by pulling himself forward on other backrests as by moving his feet. No passenger is safe from the Puller. When he sits back down he pulls hard on the chair to cushion his impact, rocking me yet again. “Oh,” he exclaims loudly, and again, “Oooh!” as he settles into his chair, followed by some loud Dutch conversation with whomever sits beside him. 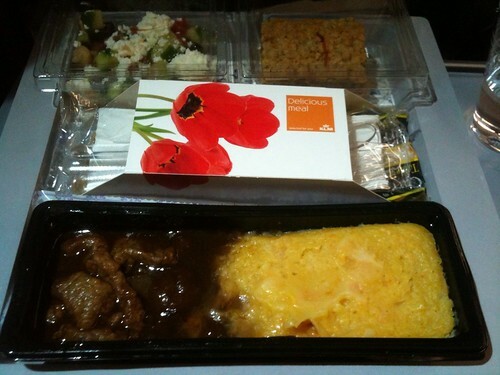 Dinner is beef with hutspot (apparently some kind of mashed potatoes) and a Greek salad with feta cheese. It’s quite good, the beef swimming in a savory brown sauce. The dessert, carrot streusel cake, is acceptable. FA takes a very long while to collect post-meal rubbish. I also discover that this A330-300 has pretty much zero trash receptacles outside of the lavatories. I finally find a bin in the rear galley, which has been purposed as the non-lav waste bin. The rear galley also has a tray of snacks and foil-sealed water cups, for which I am quite thankful. Our specific section of the cabin seems to be a warm spot, where the ventilation simply fails to cool the air. We find ourselves getting thirsty a lot. Further forward and backward passengers bundle up in blankets against the blast of air conditioning denied to us. The cabin has been dark for an acclimatory night period. Amy is watching some film with Meryl Streep as Thatcher. I’m skipping the entertainment options to alternate between listening to Game of Thrones on audiobook and writing this entry. Breakfast comes in a box: blueberry muffin, blueberry yogurt, and a little cup of orange juice. 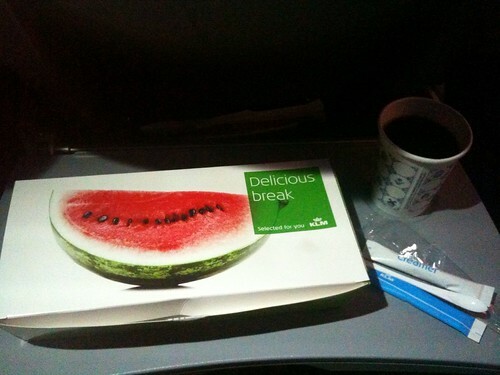 On the lid is printed “Delicious break,” as if to condition me through suggestion that this is indeed delicious. Coffee is served as well. One hour to landing. The babies have quieted down. A post-meal line has formed down the aisle to the lavatory, a steady flow of passengers brushing against my arm. In one of the aft lavatories, flight crew has filled the paper towel dispenser over the sink with tissues instead of paper towels, making it nearly impossible to dry my hands after washing. The thin, insubstantial tissues simply disintegrate in my wet fingers when I try to pull at them. Naturally on descent the crying starts up again, as the children have no idea how to equalize ear and sinus pressure. I wish their parents would make them yawn or show them the Valsalva maneuver or something, but I guess below a certain age that just doesn’t work. 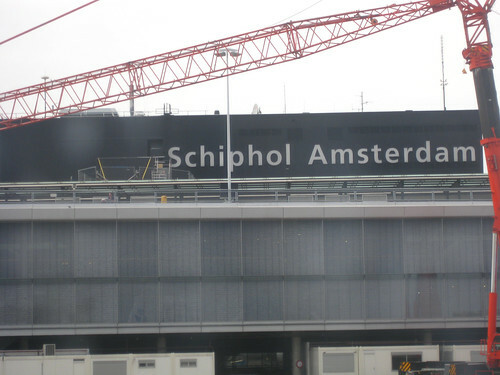 Wheels down, Schiphol Amsterdam. Seven hour layover before the flight to Venice.